Each member of the award‑winning Electro‑Voice portable loudspeaker family is designed and engineered in the USA to deliver best‑in‑class performance across every detail. The components inside every EV loudspeaker are manufactured and tested to the industry's highest standards, to ensure years of superior sound quality and reliability. 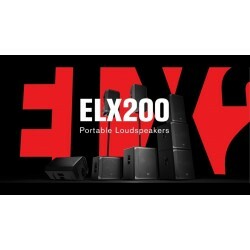 ELX200-10P 10" Powered LoudspeakerELX200-10P features high-efficiency Class-D power amplifiers (up t..
ELX200-12 12" Passive Loudspeaker1200 W (peak), 128 dB peak SPL system that is reliability verified ..
ELX200-12P 12" Powered LoudspeakerEV QuickSmart Mobile application: quickly and wirelessly configure..
ELX200-12S 12" Passive Subwoofer1600 W (peak), 129 dB peak SPL utilizing high sensitivity transducer..
ELX200-12SP 12" Powered SubwooferEV QuickSmart Mobile application: quickly and wirelessly configure,..
ELX200-15 15" Passive Loudspeaker1200 W (peak), 130 dB peak SPL system that is reliability verified ..
ELX200-15P 15" Powered LoudspeakerEV QuickSmart Mobile application: quickly and wirelessly configure..
ELX200-18S 18" Passive Subwoofer1600 W (peak), 133 dB peak SPL utilizing high sensitivity transducer..
ELX200-18SP 18" Powered SubwooferEV QuickSmart Mobile application: quickly and wirelessly configure,..